"AT-XT" redirects here. For the IBM computers, see IBM Personal Computer. For the XT 286, see IBM Personal Computer XT. "at at", "AT-ST", "AT-OT", and "AT-AR" redirect here. For other uses, see ATAT, ATST, ATOT, and Atar (disambiguation). "AT-RT", "AT-TE", and "AT-AP" redirect here. For the type of cancer, see ATRT. For the name, see Atte. For the Google division, see Google ATAP. Walkers are vehicles from the Star Wars universe that traverse the landscape on mechanical legs. They are used by the Old Republic, the Galactic Empire, and the First Order for ground assault or transport. Throughout the saga walkers have played a pivotal role in the fate of characters and the outcome of battles. Industrial Light and Magic (ILM) is responsible for their animation and design, often using models, stop-motion animation, and relevant matte paintings to depict their presence in the films. There are a variety of walkers: The Empire Strikes Back introduces the All Terrain Armored Transport (AT-AT) and All Terrain Scout Transport (AT-ST). Star Wars: Episode II – Attack of the Clones and Star Wars: Episode III – Revenge of the Sith introduced earlier models of walkers, such as the AT-TE (All-Terrain Tactical Enforcer), and the Star Wars expanded universe features numerous others. Walker variants have been merchandised and featured in popular culture. The All Terrain Armored Transport, or AT-AT walker, is a quadruped mechanized infantry combat vehicle used by the Imperial ground forces. Standing over 20 metres (66 ft) tall with blast-impervious armour plating, these massive constructs are used as much for psychological effect as they are for tactical advantage. The AT-AT (correctly pronounced "at"-"at", but often mispronounced as using only the letters A.T.-A.T.)[dubious – discuss] was first introduced in The Empire Strikes Back and also appears in Return of the Jedi. The AT-AT also appears in a destroyed form in Star Wars: The Force Awakens. Joe Johnston's original design for the Empire's war machines was a giant, multi-wheeled vehicle; this design later became the "Juggernaut" in West End Games' roleplaying material, and the design was reworked into the clone turbo tank for Star Wars: Episode III – Revenge of the Sith. Johnston said Lucas wanted the walkers to look like anthropomorphic walking tanks to make them frightening. For The Empire Strikes Back, however, the final design was a four-legged walker. Inspiration for the AT-AT came from Paraceratherium, an extinct genus of rhinoceros and the largest land mammal in history. George Lucas later dismissed claims that the AT-AT design was inspired by container cranes at the Port of Oakland (across San Francisco Bay from ILM's San Rafael offices), calling it a "myth"; animator Phil Tippett told the San Francisco Chronicle the same thing. ILM created models ranging from six to fifty centimetres (2–20 inches) in height. ILM filmed the AT-ATs using stop-motion animation against matte paintings created by Michael Pangrazio because attempts at compositing miniature footage against live-action background footage yielded mediocre results. Additionally, ILM studied elephants to determine the best way to animate the four-legged AT-ATs. Although the stop-motion animation style gave the AT-ATs a jerky, "staccato-like" effect on film, ILM found this movement acceptable because of the AT-ATs' mechanical nature. The sound of the AT-AT walking was created by Sound Designer Ben Burtt, by using the sound of an industrial sheet metal stamper. Dialog in National Public Radio's adaptation of The Empire Strikes Back says that AT-ATs "look like animals"; the character goes on to describe the vehicles as carrying "extremely heavy armor and armaments". The AT-AT, designed to favor "fear over function", can carry up to five speeder bikes and 40 Imperial stormtroopers. The head/cockpit armament consists of two side-mounted medium blaster cannons and two chin-mounted heavy laser cannons. It is manned by two AT-AT Drivers, which are combat drivers specialized in operating the Imperial Army's AT-AT walkers, wore distinct battle armour, similar in design to that of a modified basic Stormtrooper. The drivers operated the walker's movement and firing controls, and are overseen by a commander who sits behind them in the cockpit. Manufactured by Kuat Drive Yards, Expanded Universe sources describe the AT-AT as being either 15 metres (49 ft) or 22.5 metres (74 ft) tall. The AT-AT's rate of stride is not fast, but this fact is mitigated by the immense height of its legs. They can outrun opponents that underestimate AT-AT walking speed, while their neck can pivot quickly enough to bring their heavy weaponry to bear against even fast-moving craft like snowspeeders. Their blasters and laser cannons do not have a high rate of fire, but the shots are powerful enough to destroy most small targets in one to two shots. Their armor is resistant to most standard blaster weapons; however, the "neck" column of the walker holds no such invulnerability and, if shot, can cause the entire walker to be destroyed. The AT-AT is the primary assault vehicle during the Battle of Hoth, first depicted in The Empire Strikes Back. In the film, the AT-ATs are responsible for destroying the shield generator protecting the Rebel headquarters, taking out soldiers, artillery batteries, and snowspeeders in the process. Luke Skywalker, realizing that the walkers are all but impervious to artillery and snowspeeder blaster fire, orders his squadron's snowspeeders to entangle their legs with tow cables, a trick he remembered using on Tatooine to rein in hard-to-control farm animals. Wedge Antilles and his gunner Wes Janson successfully bring down an AT-AT using the tow cable, shortly after another snowspeeder scores direct hit on the fallen AT-AT's neck which causes a huge explosion. Skywalker, after being shot down and narrowly escaping his stricken snowspeeder before it is crushed beneath the AT-AT's leg, used his hoist cable to latch upon that AT-AT's underside, with a slash of his Lightsaber cutting away a panel so he can toss a thermal detonator inside, causing a series of internal explosions culminating with the cockpit and the walker toppling over. In the novelization of The Empire Strikes Back, General Veers' AT-AT is destroyed when its cockpit is rammed by a snowspeeder piloted by Derek "Hobbie" Klivian, however this never made it into the final cut of the film. An AT-AT makes a brief appearance in Return of the Jedi; one walks up alongside a landing platform on Endor to deliver Luke to Darth Vader. The first appearance of an AT-AT in the Star Wars Rebels TV series occurs in the second-season episode Relics of the Old Republic, when Agent Kallus unsuccessfully confronts the rebels while on Seelos, with a trio of the four-legged walkers challenging Captain Rex's retired clone cohorts and their own much-modified AT-TE six-legged walker, where the rebels are hiding out. A ruined AT-AT appears in Star Wars: The Force Awakens as the makeshift home of the scavenger Rey on the planet Jakku. The AT-ST is a two-legged mech walker introduced briefly in The Empire Strikes Back and featured extensively in Return of the Jedi. Due to their design and movement, they are often dubbed as a "chicken walker". The name Scout Walker is also used to refer to an AT-ST. This name was used for the official toy instead of the AT-ST name. An AT-ST also appears briefly in Rogue One: A Star Wars Story, patrolling Jedha City following an attack by Saw Gerrera's forces. A single AT-ST makes a brief appearance in The Empire Strikes Back alongside the larger AT-ATs during the Battle of Hoth. The AT-ST was meant to have more screen time; however, one scene depicting a snowspeeder shooting at the AT-ST model was ruined when the set's background shifted. For Return of the Jedi, ILM made the AT-ST design more detailed. Numerous models were created, including a full-sized AT-ST for on-location shooting. Director Richard Marquand and producer Robert Watts had cameos as AT-ST operators for the scene in which Chewbacca (Peter Mayhew) and a pair of Ewoks commandeer an AT-ST.
Lee Seiler sued Lucasfilm in the mid-1980s, claiming that the AT-ST infringed on his copyright on what he called a "Garthian Strider", which he said he created in 1976 or 1977. The case was dismissed with the court noting that not only did Seiler not produce the supposed drawings at trial, but that the copyright came one year after The Empire Strikes Back debuted. Star Wars guidebooks describe the AT-ST as a "reconnaissance or defensive vehicle [that] is lightweight and built for speed". Their agility allows them to defend the larger slower AT-ATs or support other Imperial ground forces. Two AT-STs, with their legs folded up, can be carried inside the cargo hold of an AT-AT. AT-STs are 8.6 metres (28 ft) tall (although some sources describe them as 7 metres or 23 feet) and seat a pilot and co-pilot. AT-STs are armed with laser cannons on the "chin" and sides, feet claws for destroying small defenses, and side-mounted concussion missile launchers. In The Empire Strikes Back, an AT-ST scouts for and supports the slower AT-ATs during the Battle of Hoth. Video games recreating the Battle of Hoth feature numerous AT-STs which are vulnerable to snowspeeder blasters unlike the larger AT-ATs. During the ground skirmish of the Battle of Endor in Return of the Jedi, after initially taking heavy casualties from four AT-STs, the protagonists and the local Ewok tribes destroy several AT-STs and commandeer another one; the AT-ST's precariously balanced nature proves highly vulnerable to the Ewoks' primitive booby traps. Their armors are also significantly weaker than those of AT-AT: their own lasers proved sufficient to completely destroy one, and another one was crushed by two large tree trunks launched against it. In the Expanded Universe, AT-STs are often featured in Imperial attack forces. Some more advanced Imperial walker designs have been influenced by the AT-ST. Video games such as Star Wars: Rogue Squadron and Shadows of the Empire (in a much expanded Battle of Hoth) include numerous AT-STs, and these can be destroyed by direct shooting from the player's craft, in contrast to the heavily armored AT-ATs which have to be tripped by tow cables. AT-STs are also player-controllable units in several real-time strategy games. The so-named "All Terrain Defense Pod" (AT-DP) depicted in Star Wars Rebels was used by the Empire on Lothal, Ezra Bridger's homeworld, to enforce their will against the planet's inhabitants during the first season of the series. It is stated as being among the fastest-moving "walkers" of any of the AT-ST variants, and is only lightly armed with a single, forward-aimed energy cannon. The All Terrain Tactical Enforcer, or AT-TE walker, is a six-legged mechanized infantry combat vehicle used by the Grand Army of the Republic ground forces. It appears in Attack of the Clones, Revenge of the Sith, The Clone Wars multimedia campaign, Star Wars Battlefront II and in the early episodes from the second season of Star Wars Rebels. Conceived by Ryan Church as a predecessor to the AT-AT, the AT-TE's animation for Attack of the Clones was supervised by Rob Coleman. Tom St. Amand, who worked on the AT-AT scenes in The Empire Strikes Back, provided his experience to create a similar appearance for the AT-TE. In addition to the AT-TE, other vehicles were created for Clone Wars media and depicted as predecessors to the walkers featured in the original trilogy. One such walker is the two-legged All Terrain Attack Pod (AT-AP), a variation of the AT-PT, seen in Revenge of the Sith and Clone Wars media. Alex Jaeger designed the AT-AP per Lucas' request to "diversify the Clone armor". The AT-AP features a variety of artillery weapons, a retractable third leg for stability, and other offensive features. The All Terrain Open Transport (AT-OT), also seen in Revenge of the Sith and other sources, is a heavily armored transport whose open design makes it vulnerable from above. The AT-OT can transport 34 clone troopers, who are protected by thick armor and four laser cannons. During the late stages of Revenge of the Sith's development, it was called the "Clone CAT walker". Clone troopers mounted on All Terrain Recon Transports (AT-RTs) search for Yoda (Frank Oz) on Kashyyyk in Revenge of the Sith. The AT-RT is described as a precursor to the AT-ST, though it also shares similarities to the AT-PTs of the same era. A scene cut from Revenge of the Sith would have shown Yoda distracting clone troopers while Chewbacca removes them from their AT-RT in a manner similar to how he obtains control of an AT-ST in Return of the Jedi. AT-RT animators studied AT-ST movement to recreate part of the "original funkiness of movement" caused by the stop-animation style used in the original trilogy. An All Terrain Armoured Cargo Transport (AT-ACT) appears in the 2016 film Rogue One. The new walkers are slightly larger than the standard AT-AT, with a hollowed-out center section that can hold a cargo container. As depicted in the film, it appears to be easier to destroy AT-ACT vehicles, as their armor does not appear to be as strong as their AT-AT counterparts. Under sustained fire, their leg joints can be destroyed, causing the vehicle to fall, and they can be broken in half when fired upon without the cargo container in place. Star Wars: The Last Jedi introduces several new walking vehicles used by the First Order. The AT-M6 (All Terrain MegaCaliber Six), also dubbed "gorilla walkers," are the most prominently featured. The AT-HH (All Terrain Heavy Hauler) features many more legs than most walkers to allow it to tow heavy cargo. The First Order also uses updated versions of the AT-AT and AT-ST. The All Terrain Personnel Transport (AT-PT), introduced during the climax of Timothy Zahn's novel Dark Force Rising, is a two-legged, one-person vehicle designed for the Old Republic as a "personal weapons platform for ground soldiers." The AT-PT is equipped with two blaster cannons, a concussion grenade launcher, and an array of sensors. The AT-PT is also featured in several video games, including Star Wars: Rogue Squadron, Star Wars: Force Commander, and Star Wars: Galactic Battlegrounds. The Jedi Academy Trilogy introduces MT-ATs ("spider walkers") designed specially for mountain terrain. 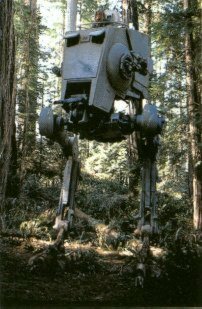 The All Terrain Anti-Aircraft (AT-AA), featured in various Expanded Universe media, is a four-legged anti-aircraft vehicle used by the Galactic Empire. The All Terrain Advance Raider (AT-AR) appears in Marvel Comics' Star Wars series and an All Terrain Experimental Transport (AT-XT) appears in LucasArts' Star Wars: The Clone Wars game. DK Publishing's Attack of the Clones: Incredible Cross-Sections book mentions an All Terrain Heavy Enforcer. In the Star Wars Rebels "sub-universe", the All Terrain Defense Pod (AT-DP) is a powerful predecessor of the AT-ST and has the ability to dock with flying transports, much like the AT-TE can. On Lothal, many of these chicken walkers are used for hunting the young rebellion. Kenner released AT-AT and AT-ST toys as part of their Empire Strikes Back line, and Hasbro released toys based on those molds when the Special Edition trilogy was distributed. Micro Machines also released AT-AT, AT-ST, and AT-TE toys. Both Decipher Inc. and Wizards of the Coast published AT-AT and AT-ST cards for their Star Wars Customizable Card Game and Star Wars Trading Card Game, respectively. Lego has released AT-AT, AT-ST, AT-AP, AT-OT, AT-RT, and AT-TE models. ^ a b c "All Terrain Armored Transport (AT-AT walker) (Expanded Universe)". Star Wars Databank. Lucasfilm. Retrieved 2007-10-08. ^ "Rebels Recon #2.03: Inside "Relics of the Old Republic" | Star Wars Rebels". YouTube. Star Wars. Retrieved 29 April 2017. ^ "Pablo Hidalgo on Twitter". Twitter. Retrieved 29 April 2017. ^ "clone turbo tank (Behind the Scenes)". Star Wars Databank. Lucasfilm. Retrieved 2007-10-14. ^ Bouzereau, Laurent (1997). Star Wars: The Annotated Screenplays. Ballantine Books. p. 148. ISBN 0345409817. ^ Angela Watercutter (24 May 2012). "35 Years After Star Wars, Effects Whiz Phil Tippett Is Slowly Crafting a Mad God". Wired. Retrieved 16 February 2013. ^ Peter Hartlaub (25 June 2008). "Nah, dude, they weren't cranes, they were garbage trucks". San Francisco Chronicle. Retrieved 3 April 2014. ^ a b c Burns, Kevin and Edith Becker (2004). Empire of Dreams: The Story of the Star Wars Trilogy (Documentary). ^ "All Terrain Armored Transport (AT-AT walker) (Behind the Scenes)". Star Wars Databank. Lucasfilm. Retrieved 2007-10-08. ^ a b "All Terrain Armored Transport (AT-AT walker) (The Movies)". Star Wars Databank. Lucasfilm. Retrieved 2007-10-08. ^ Lund, Kristin; Simon Beecroft; Kerrie Dougherty; James Luceno (2005). The Complete Locations of Star Wars: Inside the Worlds of the Entire Star Wars Saga. Dorling Kindersley. ISBN 0-7566-1419-8. ^ a b c d Slavicsek, Bill (2000). A Guide to the Star Wars Universe: Third Edition. Del Rey and Lucas Books. p. 14. ISBN 0-345-42066-7. ^ a b c d "All Terrain Scout Transport (AT-ST walker) (Behind the Scenes)". Star Wars Databank. Lucasfilm. Retrieved 2007-10-08. ^ Seiler v. Lucasfilm, Ltd., 613 F.Supp. 1253 (1984), affirmed, 808 F.2d 1316 (1986). Retrieved 10 Aug. 2013. ^ a b "All Terrain Scout Transport (AT-ST walker) (The Movies)". Lucasfilm. Retrieved 2007-08-15. ^ a b Gorden, Greg (1993). Star Wars Imperial Sourcebook (2nd ed.). West End Games. ISBN 0-87431-210-8. ^ "All Terrain Scout Transport (AT-ST walker) (Expanded Universe)". Star Wars Databank. Lucasfilm. Retrieved 2007-08-15. ^ "AT-DP Walker". Star Wars Databank. Lucasfilm. Retrieved 2015-06-27. ^ a b "All Terrain Tactical Enforcer (AT-TE walker) (Behind the Scenes)". Star Wars Databank. Lucasfilm. Retrieved 2007-08-15. ^ a b "All Terrain Tactical Enforcer (AT-TE walker) (The Movies)". Star Wars Databank. Lucasfilm. Retrieved 2007-08-29. ^ a b "All Terrain Tactical Enforcer (AT-TE walker) (Expanded Universe)". Star Wars Databank. Lucasfilm. Retrieved 2007-08-29. ^ "All Terrain Tactical Enforcer (Expanded Universe)". Starwars.com Database. Retrieved 2007-08-29. ^ "All Terrain Tactical Enforcer". Star Wars.com Database. Retrieved 2007-08-29. ^ a b "All Terrain Attack Pod (AT-AP walker) (Expanded Universe)". Star Wars Databank. Lucasfilm. Retrieved 2007-10-08. ^ "All Terrain Attack Pod (AT-AP walker) (Behind the Scenes)". Star Wars Databank. Lucasfilm. Retrieved 2007-08-29. ^ "All Terrain Open Transport (AT-OT walker) (The Movies)". Star Wars Databank. Lucasfilm. Retrieved 2007-08-29. ^ "All Terrain Open Transport (AT-OT walker) (Expanded Universe)". Star Wars Databank. Lucasfilm. Retrieved 2007-08-29. ^ "All Terrain Open Transport (AT-OT walker) (Behind the Scenes)". Star Wars Databank. Lucasfilm. Retrieved 2007-08-29. ^ "All Terrain Recon Transport (AT-RT walker) (The Movies)". Star Wars Databank. Lucasfilm. Retrieved 2008-10-09. ^ a b "All Terrain Recon Transport (AT-RT walker) (Behind the Scenes)". Star Wars Databank. Lucasfilm. Retrieved 2008-10-09. ^ Breznican, Anthony (June 22, 2016). "This Week's Cover: New details on the new Star Wars stand-alone film 'Rogue One'". Entertainment Weekly. Time Inc. Retrieved June 22, 2016. ^ "AT-ACT walker". StarWars.com. Retrieved 2016-11-08. ^ a b Slavicsek, Bill (2000). A Guide to the Star Wars Universe: Third Edition. Del Rey and Lucas Books. pp. 12–13. ISBN 0-345-42066-7. ^ "All Terrain Anti Aircraft (AT-AA walker) (Expanded Universe)". Star Wars Databank. Lucasfilm. Retrieved 2007-10-08. ^ Saxton, Curtis (2002-04-22). Incredible Cross-sections of Star Wars Episode II - Attack of the Clones: The Definitive Guide to the Craft. Dorling Kindersley Publishers. ISBN 0-7513-3744-7. ^ "AT-AT". Star Wars Cargo Bay. Lucasfilm. Retrieved 2007-10-09. ^ "Republic AT-TE". Star Wars Cargo Bay. Lucasfilm. Retrieved 2007-10-09. ^ "#V: Rebel Transport, TIE Bomber, AT-ST (1995)". Star Wars Cargo Bay. Lucasfilm. Retrieved 2007-10-09. ^ "#IV: Probot, AT-AT, Snowspeeder (1995)". Star Wars Cargo Bay. Lucasfilm. Retrieved 2007-10-09. ^ "Star Wars Customizable Card Game Complete Card List" (PDF). Decipher, Inc. 2001-08-23. Archived from the original (PDF) on 2007-09-28. Retrieved 2007-08-23. ^ "All Terrain Armored Transport". Star Wars Cargo Bay. Lucasfilm. Retrieved 2007-10-09. ^ "All Terrain Scout Transport". Star Wars Cargo Bay. Lucasfilm. Retrieved 2007-10-09. ^ "Imperial AT-ST". Star Wars Cargo Bay. Lucasfilm. Retrieved 2007-10-09. ^ "Mini AT-ST and Snowspeeder". Star Wars Cargo Bay. Lucasfilm. Retrieved 2007-10-09. ^ "LEGO Imperial AT-ST Special Edition". LEGO.com archives. Lucasfilm. Retrieved 2010-12-10. ^ "AT-AP Walker". LEGO Shop. Retrieved 2008-02-05. ^ "AT-TE". Star Wars Cargo Bay. Lucasfilm. Retrieved 2007-10-09. ^ "Mini AT-TE". Star Wars Cargo Bay. Lucasfilm. Retrieved 2007-10-09. Wikimedia Commons has media related to AT-AT. This page was last edited on 22 April 2019, at 21:41 (UTC).